Unfortunately the day I finally got someone to start working on my bathroom, after a looooong delay, I had to fly out to Houston for work. I got back today to assess the work and... there is a lot to process. First off, the demolition is complete, so that is cool. The wall that once separated the bathroom from the spare room’s extra closet is now officially part of the bathroom. The tile and underlying concrete/ grout is removed, leaving joists and floorboards. The plumbing and electrical is laid bare for all to see, so we can figure out what needs to be replaced and what can stay. 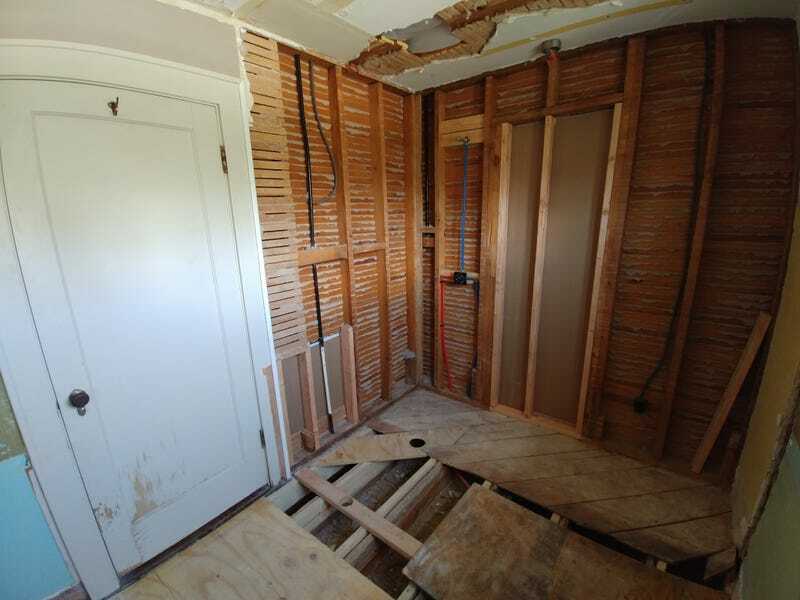 They even got some work done roughing in the shower and vanity plumbing. The bad news is we had to stop work. On Wednesday it became apparent the contractor, project manager, owner (me), and architect all had separate visions of what was going on. This despite many meetings, phone calls, renders, and drawings. I’ll admit, we got started fast and didn’t have some of the details, like what tub, faucet, or shower valves we were going to use. In retrospect those thing would have been good to know. This being my first major home project... it also would have been good for the project manager to like.... TELL ME THESE THINGS. Again, in hindsight, I should have guessed. This highlights the need for a 3rd party to coordinate contractors, manage the work, and make sure everyone is on the same page. Oh wait. I’m paying someone to do that. On the bright side the room is now roughly its final size, so visualizing everything should be a piece of cake now. The real question is do I fire the project manager, or give him a second chance? Oh, and the contractor left me this in the driveway.